So this post comes a little late (I am currently sitting in a hotel in Dubai waiting to check out). I wanted to yet again share some head wrap styles! I had posted a few photos on Instagram (yes I am addicted) and was kindly requested to do a demonstration of one of the styles so I figured I would do 2 styles in one video. In the first example of my video I start of with a messy bun that is covered with a satin scarf first (since the outer scarf I use is neither Satin nor Silk) and then I used the outer scarf. For the second style I start off with 2 really rough flat twists that I pin down and again use my satin scarf first followed by the outer scarf. I would love to hear if you use scarfs during winter to help protect your hair? This entry was posted in Accessories, Accessorizing a protective style, Head Scarves, Head Wraps, Protective Head Sarves, Protective Head Scarves, Protective Head Wrap, Protective Style, protective updo and tagged hair wrap, hair wrapping, head scarf, head wrap, head wrapping, headwrap, How to Nefertiti head wrap, natural hair protective style, Nefertiti head scarf, Nefertiti head wrap, protecting natural hair, Protective Head Wrap, Protective Style, winter protective style, wrapping natural hair on December 15, 2015 by Maicurls. 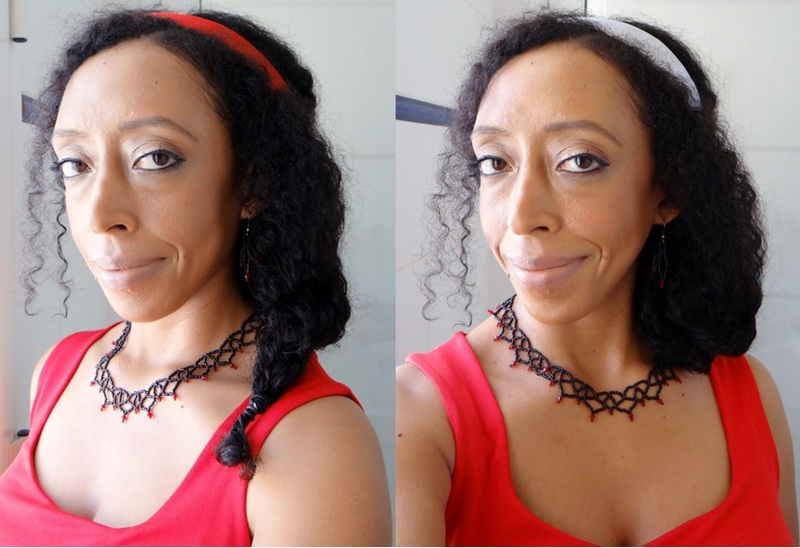 So today I have a styling tutorial of my Milkmaid Twists. Now I will point out that I am not all that crazy about how this particular style looks on me (I love the style on others) the main reason why I don’t like it on myself that much is because my forehead and ears become quite obvious because all my hair is pulled back and away from my face LOL. I do like the fact that it is a protective/ low manipulation style since your hair is tucked away and can be left alone for days even. 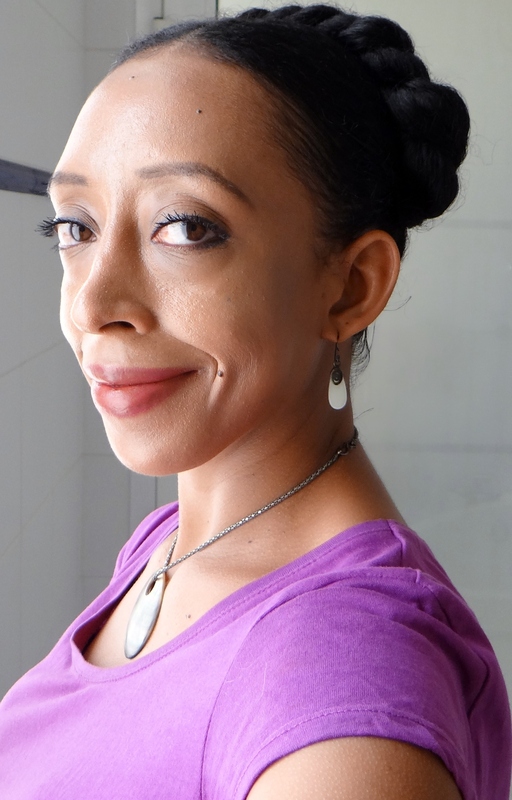 The first step is to split my hair in the middle in order to make two side ponytails (please note again apart from the frizz I also don’t make neat partings – I have issues). After parting, I use some FSG to help smooth out my hair and “tame” the frizz a little. I also follow up with a little of my Hair Pomade on my edges to help provide a little extra shine and thanks to the ingredients in the pomade it also helps protect and aid in the health of my edges. I use the soft bristle brush to bring my hair together and distribute the products applied. The soft bristle brush along with the gel and pomade really helps to give that “smooth” look. I pull my hair together into two side ponytails and then two strand twist each side. I then cross each twist over the top and bobby pin them on the opposite side (under the base of the twist) and tuck away the ends under the base of each twist and that is it. Whenever I do this style I actually just take down the bobby pins, cover my hair with a scarf for the night and the next morning I touch up my edges if there is need to and then re-pin them down so I get to protect my hair for a few days. Would love to hear if you do Milkmaid Twists, if your method is different or if you have any suggestions for me. This entry was posted in Accessories, Accessorizing a protective style, Edge taming Pomade, Edge taming product, Flaxseed Gel, Low manipulation, Low Manipulation Styles, Milkmaid Twists, Natural Hair Styles, Protective Style, Protective Styles, Two Strand Twist and tagged Low manipulation style, low manipulation style on natural hair, Milkmaid low manipulation style, Milkmaid twist protective style, Milkmaid Twists, natural hair, natural hair styles, Natural Hairstyle, Protective Style, protective style on natural hair, two strand twists on October 31, 2015 by Maicurls. 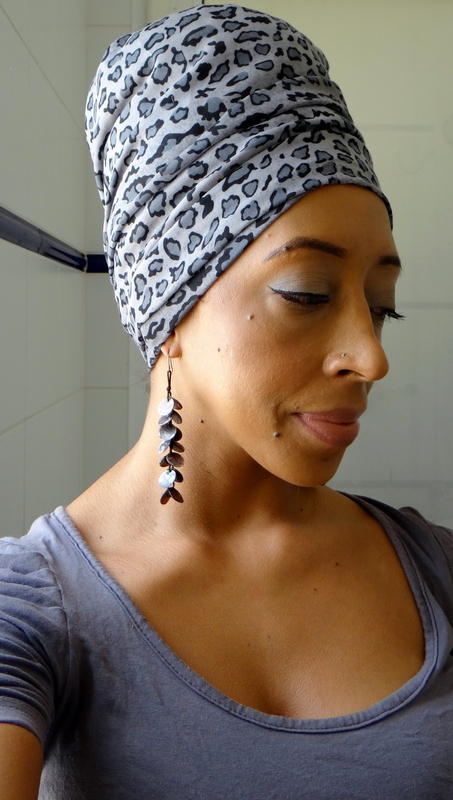 I use the silk satin scarf to cover the bun – I use this to help protect my hair from the external scarf/wrap since that is made of cotton and also because it helps to make the wrap appear bigger. I first tuck one end of the external scarf against my scalp and then wrap upwards, tugging/pulling and adjusting as needed. I then tuck away the other end at the very top and continue to adjust till I am happy. Le fin! To make it easier I of course have a video tutorial of the whole process. I also did a little “demo” of the same style with different scarves. I hope my IG friend get’s to see this video 😀 and I would love to hear what you all think of this style! This entry was posted in Accessories, Accessorizing a protective style, Head Scarves, Head Wraps, Protective Head Sarves, Protective Head Scarves, Protective Head Wrap and tagged hair wrap, hair wrapping, head scarf, head wrap, head wrapping, headwrap, How to Nefertiti head wrap, natural hair protective style, Nefertiti head scarf, Nefertiti head wrap, wrapping natural hair on August 3, 2015 by Maicurls. I as always have a video tutorial for an easy explanation. 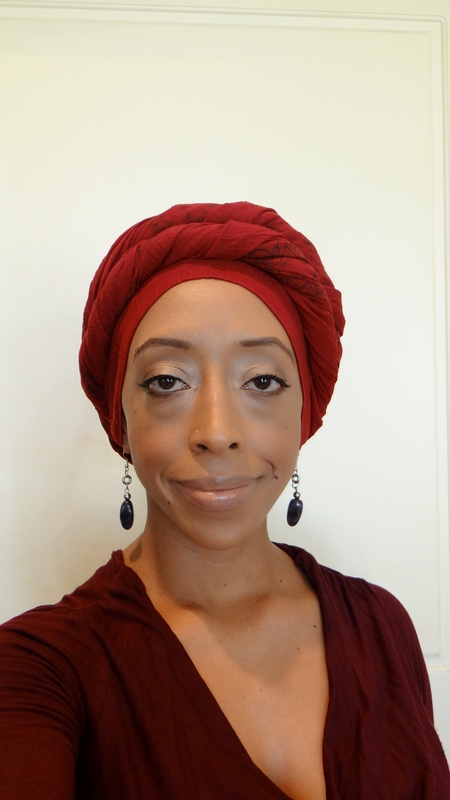 I have a few other head wrap videos and tutorials: Double Knot Head Wrap & Turban Wrap. Would love to hear what you think! This entry was posted in Accessories, Accessorizing a protective style, Head Scarves, Head Wraps, Protective Head Scarves, Protective Head Wrap, Protective Styles, Wrapping natural hair and tagged Head Scarves, Head Wraps, how to protect natural hair with a head scarf, how to protect natural hair with a head wrap, how to tie a head scarf, How to tie a head wrap, natural hair, naturalista, Protective Head Scarves, Protective Head Wrap, protective style head scarf, protective style head wrap, protective style with head scarves, Protective style with head wrap, Protective Styles, team natural on June 7, 2015 by Maicurls. There are a number of different ways in which I like to do the Gibson Tuck and today I wanted to share this method. It really is as simple and easy as it looks. 2 two strand twists on either side, 1 forward “flat twist” at the front (don’t judge my “forward flat twist” I know it is ugly LOL) and then you tuck away the rest of the hair by rolling and tucking it away under the headband. Pin back the twists and presto you are done! I use a headband for two reasons. 1. it acts as an accessory and 2. I use it to help tuck away the hair that isn’t twisted. I also took a few pictures of another versions of the style and changed up the headband (I really need to make a new headband to spruce things up). What do you think, Gibson tucks yay or nay? Do you have favorite Gibson tuck styles? If so let me know, I would love to hear from you! This entry was posted in Accessorizing a protective style, Gibson Tuck, Low manipulation, Low Manipulation Styles, Protective Style, protective updo and tagged Gibson tuck, Gibson tuck on natural hair, low manipulation hairstyles, low manipulation natural hairstyle, Low Manipulation Styles, natural hair, natural hair Gibson tuck, natural hair styles, Natural hairstyles, protecting natural hair, protective natural hairstyle, Protective Styles, tuck and roll natural hairstyle, tuck and roll. tuck and roll natural hair on March 10, 2015 by Maicurls. So before I even begin to go through the process, me a minute to explain why I opted to (yet again) show you two simple styles. Ignoring the fact that doing an easy style just is my thing, sometimes overdoing our hair can just be annoying, nerve wrecking (especially if this is going to be a first date) and not to mention it can potential cause damage and/or breakage. In all honesty it is one style – two different looks. The first starts with one chunky side twist (pictures 1 below) & is accessorized with a ribbon. The second look is also a chunky twist but I pin the end of the twist by bringing it forwards and over and use a bobby pin to hold the hair down – I pin the hair underneath (by my ear – pictures 2 below). What I use is: a hair bubble, bobby pins and ribbons (you can use a head band). I have a video of the process and the “looks” can be done in no more than 5 minutes! They are simple yet pretty (in my opinion lol) and you don’t have to worry about curls setting, damp frizzy results etc. on Valentines day. This entry was posted in Accessorizing a protective style, Low manipulation, Low Manipulation Styles, Natural Hair Low manipulation styles, Natural Hair Protective Styles, Natural Hair Styles, Natural hair Updo, Protective Style, protective updo, Two Strand Twist, Updo hairstyles, Using ribbons to accessorize twists and tagged Accessories for hair, accessorize protective style, accessorizing protective styles, Chunky side twist, Chunky Twist, chunky two strand twist, Hair accessories, Low Manipulation Styles, natural hair, natural hair styling options for Valentines Day, Natural hairstyles, Protective Styles, ribbons as an accessory for hair, ribbons for hair, two strand twist, two strand twist with ribbons, Valentines Day hairstyles, Valentines Day Styles on February 12, 2015 by Maicurls.